Sitting up in the superbly comfortable cockpit, the coamings up to mid shoulder blade and the view over the cabin just nicely at eye level the mind swaps the walls of the building shed for visions of endless waves, or a long cloud with a dark peak underneath just showing above the horizon, or at times the headland of a port as yet new to the skipper. It’s a great place to dream of Resolutions voyages to come, and a good place to relax while mulling over the progress to date. It's been a while since I wrote, my house is now far enough complete for us to be living there, it even has doors! The plumbing all works, the drains ditto, there are 21 power points in the kitchen and lounge (one room) and the rest of the place is similarly endowed with electrical connections, and although there is much more to do its habitable which is a relief. Remember this? 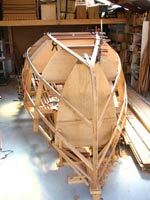 It’s a bit less than 2 years ago when the framework began to take shape, here are the frames and chine stringers in place and the shape of the boat beginning to appear. While it was a buzz to watch the anonymous looking pile of parts begin to fit together and the shape becoming evident there was a long way to go. 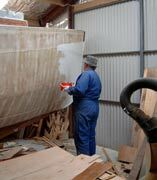 With the woodwork almost complete, the paint starts to go on, a real landmark. Charlie in the meantime has built both hatches, complex ones with double coamings and built in drains that took quite a while to build but which I hope will be blessed when it's windy and wet with spray flying and the cabin with the heater going is a warm dry refuge from the turmoil outside. He’s also completed the cockpit coamings with its reinforced winch mountings, the rudder, and you can be sure that when this man sized blade is turned the boat will obey, it’s a big lump of hardwood and very strong, and many other smaller jobs. This week, the paintbrush came out, and that is a real landmark. A high build two part epoxy primer is being used, brushable, and two coats will be used before sanding and coating with an oil based enamel paint that will be easy to maintain and recoat when needed. Today, there is a boat, it would float if dropped into the water, even though the ballast has yet to be fitted it would float upright. There is an interior, bunks and galley, heads and engine, office desk and lots of lockers. Painting is well under way with most of the boat covered in two part epoxy primer over the fiberglassing so the sun wont damage the epoxy resins when Resolution goes outside in the next day or two. You will see, way back in one of the early entries in this diary, a schematic of the proposed colour scheme. Designed by Satoshi Kanai, a friend of Charlies back in Japan, this is designed to reflect the boats design name of "Sundowner" and to be highly visible at sea. 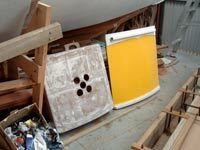 This shot shows the beginnings of the colour, the yellow transom is really bright and even when not visible from a position alongside the boat, everything aft reflects yellow. Highly visible is right! We jacked the boat up, checked her for level against the concrete floor and Charlie marked in the waterline with a felt tipped marker pen and then masking tape. Although not a strong colour or visual break that made the hull look a lot less high relative to its length. There are still rubbing and fender strakes yet to go which will make it look longer and lower, but even now its looking good. The stem is cut away to take the stem fitting where the bowsprit will mount and the big anchor fairleads bolt in alongside. The anchor well is quite big, and not only stows the ground tackle clear of the foredeck when its likely to be required , it gives the skipper a secure place to sit with feet lower when working on the foredeck. This anchor well has big drains, and although quite large does not carry a lot of water in comparison to the boats unusually large volume for her length. The two bronze castings there are mooring or marina tie up fairleads, bought on an internet trading site they were close to the ones designed for the job and very good value for money. The after end of the anchor well has the inboard end bitts for the bowsprit, and the Sampson post for mooring lines and anchor lines just after that. All bolted through a heavy beam atop frame one, and through the deck king plank. 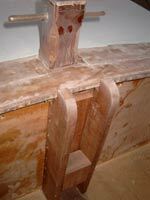 The floor of the anchor well is 1/2inch plywood and forms a brace or "breasthook" which greatly strengthens the area. The lead for the keel is arriving, lead prices have risen so rapidly that many of the sources of free lead have dried up, and Charlies had to buy half a ton to complete the 720 kg requirement for the ballast keel. Expensive, but there seems to be no way around it while so much of the world is busy throwing it at each other through the barrels of rifles. Sailing is a much better use for it but I guess that sailors are a minority. 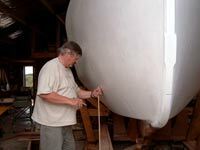 When cutting away the gunwale and stem for the bow rollers and stem fitting, two pieces were taken out that had the gunwale stringer, the deck and the two skin planking. 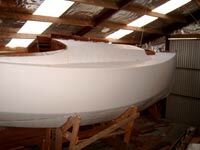 This pic shows just how solidly this little boat is built. We have a saying here in NZ, "Built like a brick **** house," I think this is even stronger. The two hatches, each laminated from 3 layers of 3/16in (4.5mm) plywood and fitted with edges and local reinforcing, they are very strong and surprisingly lightweight. 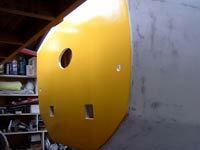 The yellow one is the main hatch, and the other the forward hatch. Note the holes in the latter are to give some light in the forepeak, and will have a piece of polycarbonate plastic bent to shape and bolted over it. Charlie's built the mould, and after some research (thanks Roger at Silverstream Foundry) he has painted the inside of the wooden mould with sodium silicate, a refractory coating used in foundry work. 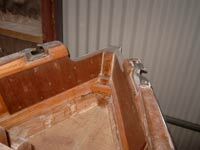 It has all the bolts and bolt head pockets built into the mould. 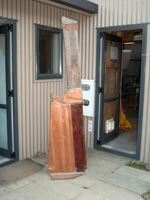 It’s a big solid piece of work, well braced, and rigid enough to cope with ¾ ton of lead being poured into it. 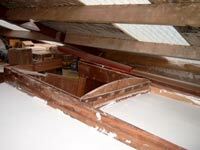 The forward hatch coamings, as with the main hatch, are double coamings with drains built in. The seal sits in on the inner lining within the hatch, and any water that gets past the outer coamings is stopped there and drains back out. Behind the hatch is the mast tabernacle, that mounts the mast in such a way that it can be lowered, and raised (in calm waters) by one person. It has fittings on it for bolting pulley blocks to, and has a crossbar on which the mast sits when the mast needs to be stowed. 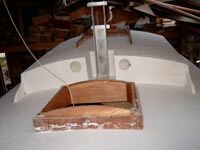 It's high so when the mast is lowered it will clear the main hatch. Visible here are the double coamings for the main hatch opening, there is a hatch "garage" over the forward end of the hatch slides to shield the hatch forward end from incoming waves, and the hatch overlaps the outer coaming leaving enough room for the drains to function. We’ll be setting up to do the big melt soon, have an old cast iron bath, some stone blocks, clay for a mould and there is a good sized coal mine about half an hour away, one guess what fuel we will be using to provide the heat. The door behind the rudder is not a dolls house door, it's a standard size, and gives an indication of just how big the rudder assembly is. The end plate is there not only to increase its effectiveness but also gives a man overboard a step on which to start the climb back up to safety. 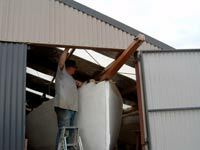 The "hook" at the top of the blade is another step, and will be drilled to take the nylon rope shock absorbing rope that prevents the rudder from being smashed up against the transom if hit by a heavy following sea. 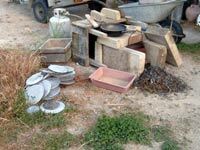 Outside we have a mini foundry, the crucible shielded by stone blocks and heated by a gas barbeque cooking ring Charlie has been test melting tyre balance weights to see what recovery there is. About 85% seems to be what we have after the steel wheel weight clips and the non lead weights have floated to the top and been skimmed off. If you do this, be aware that the fumes are very nasty! Stay upwind! 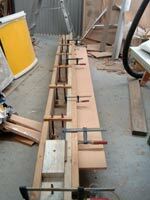 Back inside, here is the mould for the ballast casting. Made from 1 ¾ in wood and painted with sodium silicate refractory coating this has to be very strong. Close to 3.4 ton of molten lead will be poured in here within the next few days. It will be set into a ditch dug in hard clay and the fill rammed in tight around it so it cannot move during the pour. 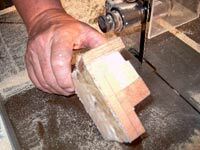 The large section dowels in the bottom of the mould form the recesses which take the bolt heads while the copper pipes become tunnels for the bolts which saves drilling the soft lead with the risk of breaking drills off. Soon it will be time to pull Resolution out of the workshop, seeing her from a little distance will be quite different from seeing her close up inside the shed. Right now she is big, taller than a man by quite a bit, wide and solid as one stands up close. I have no doubt that when she is outside and I can stand off at a distance she will look a lot smaller, not as small of course as she will when a dot on the horizon heading out into the Southern Ocean, but that’s a view that we wont see until next year.